Hello there, I hope everyone is having a nice Bank Holiday weekend? shame the sun has gone away though. here is the card that I made for Nan for her Birthday. 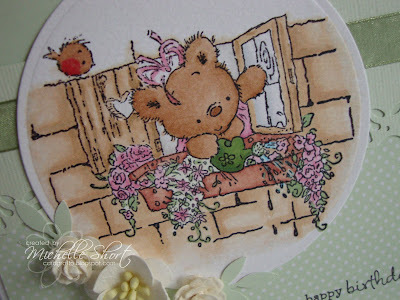 I have used the very cute LOTV Busy Bears Window Box stamp and coloured with Copics before cutting out with a Nestabilities circle and mounting to base. The base has been made using the MS Baby Girl Multimedia Pad and then a punched strip on top using the MS Botanical Scallop border punch (which is currently on offer if you follow the link) and wrapped some ribbon around. I have then stamped the greeting from the Elzybells Tags - Floral Circles set and added some Basic Grey Opaline too. Some beautiful flowers from Wild Orchid Crafts (sprayed with Glimmer Mist) added to the side of the image with some leaves punched using the MS Frond Branch punch. STAMPS: Lili Of The Valley, Elzybells Art Stamps. INK: Memento Tuxedo Black. CS: Anitas, Martha Stewart, Bazzill Basics. 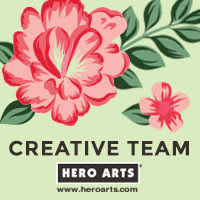 ACCESSORIES: Ribbon by Tesco, Basic Grey Opaline, Nestabilities dies, Flowers by Wild Orchid Crafts, Tattered Angels Glimmer Mist, Martha Stwart Botanical Scallop Border punch, Martha Stewart Frond Branch punch, Copic Markers - E13, E17, E33, E34, E35, E55, G20, G24, YG63, YG67, B0000, B000, B00, C00, C00, C1, W00, W1, R81, R83, R24. Gorgeous card hun! That image is so sweet and beautifully coloured. 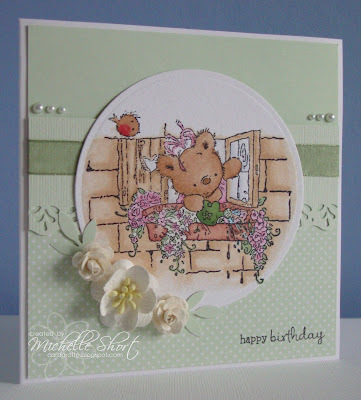 Love the shade of green you've used as your base colour and the punch and flowers really finishes the card off. Bet your Nan loves it! 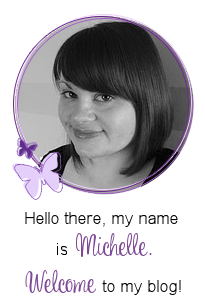 What a beautiful card Michelle,i love your image and colours. Bet your nan loved it! Oh my goodness, what a stunning card! Your nan will have absolutely loved this!